South of Dana point and accessible by trail, this is a great area for beach running. Run along the beach, which is fairly flat and has firm sand much of the time. There’s also a 2.6 mile trail alongside the beach and train tracks. It’s a mix of paved, boardwalk, sand, and dirt. Runners note: it is soft sand in a couple of sections. The northern end of the trail is off N. El Camino Real, right near the San Clemente train station. The southern end is San Clemente State Beach. There are also several access points to the trail off roads along the way. 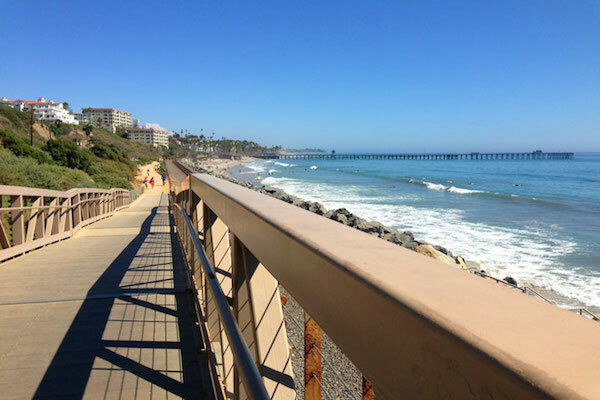 At the 1-mile mark is San Clemente Pier, which juts 0.3 miles and is a nice add-on. There’s good signage, with information about the different sections, landmarks, and access points. North end: Off N. El Camino Real, near the San Clemente train station; Southern end: San Clemente State Beach.